If you stay at the Hacienda Uxmal, you might end up sleeping in the same room once occupied by the likes of Jackie Kennedy, Henry Kissinger, Indira Gandhi, or even Queen Elizabeth II. These are just a few of the illustrious guests who have used this historic hotel as a convenient base from which to explore the spectacular Mayan ruins of Uxmal, which lie just a stone’s throw away from the resort’s front gate. Built in 1950, the Hacienda Uxmal has also long been the lodging of choice for archaeologists who come to work at Uxmal. This close connection with the nearby ruins is celebrated by an “Explorers Gallery” on the hotel’s main floor. Lining a long, open-air corridor overlooking a turquoise colored swimming pool are photographs of famous nineteenth century explorers who visited Uxmal. Among them are the American traveler and author John L. Stephens, who published Incidents of Travel in Yucatán in 1843, and Frederick Catherwood, the talented British artist who accompanied Stephens on his journeys in Mexico and Central America. Catherwood illustrated Stephens’ books with remarkably detailed and haunting drawings of the region’s abandoned cities. 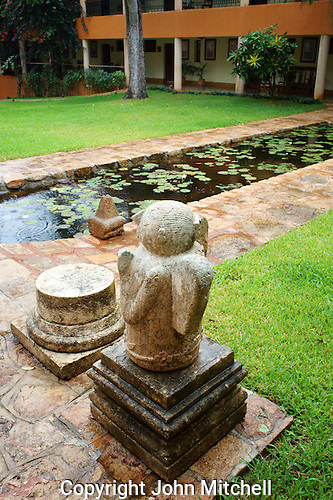 Adding to the Hacienda Uxmal’s historical ambiance are Spanish colonial touches such as Moorish arches, richly tiled floors, and iconic statues of angels and the like scattered about the grounds. The hotel’s 79 guestrooms are airy and bright, plus some have balconies surveying the rolling Puuc hills. 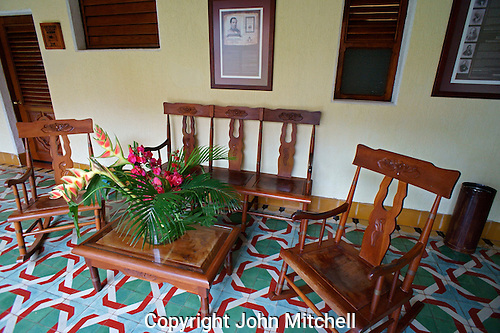 Comfortable sitting areas outside each room feature traditional wooden furniture made from local timber. These cozy arrangements make ideal spots for sitting back and taking in the hotel’s forest-like gardens while pondering the incredible legacy left behind by the ancient Maya. 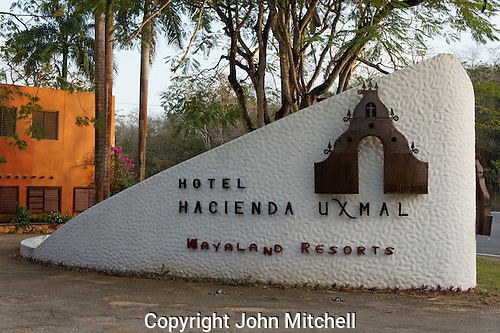 Please click on this link to watch a slideshow of my photos of the Hacienda Uxmal. It may take a few seconds to load.